Last week, Ohio members participated in National AAUP's 101st Annual Meeting and Centennial Celebration. 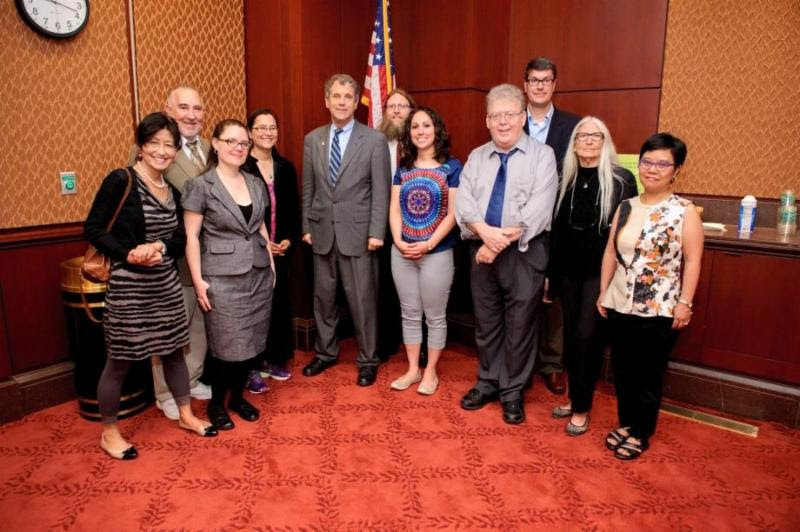 with the offices of Senators Sherrod Brown and Rob Portman, as well as Representatives John Boehner, Steve Chabot, Bob Latta, Jim Renacci, Tim Ryan and Brad Wenstrup. Members advocated for greater access and affordability for students, specifically addressing funding for, and requirements of, Pell Grants and Perkins Loans. Additionally, they lobbied for greater oversight of for-profit colleges and also discussed higher education as a public good. Ohio Conference delegates attended the Assembly of State Conferences (ASC) meetings. 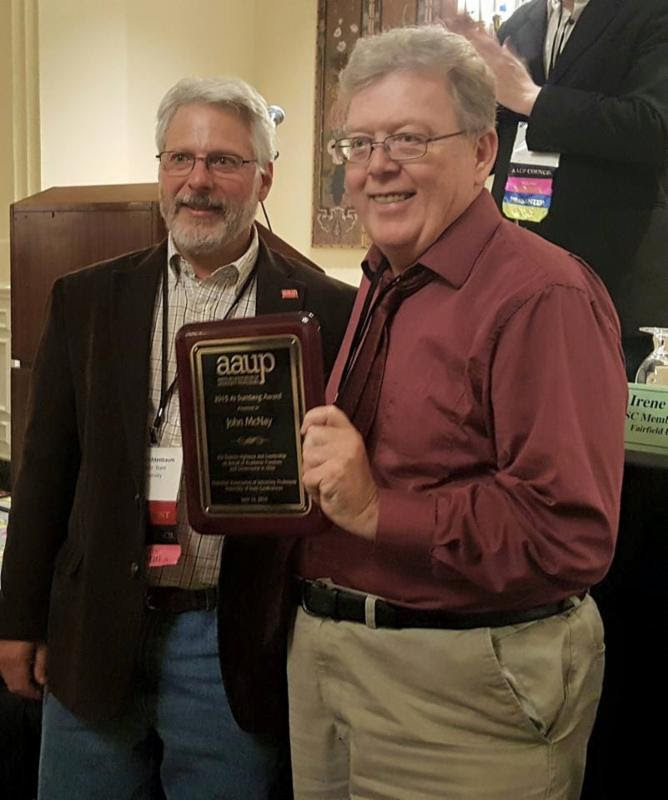 At the ASC Business Meeting, AAUP President Rudy Fichtenbaum presented OCAAUP President John McNay with the Al Sumberg Award, which is given to someone particularly effective in lobbying on issues furthering the interests of higher education or in furthering such lobbying efforts on the state level. In his remarks, Fichtenbaum stated, "No one deserves this award more than John McNay." Congratulations, President McNay! At the business portions of the full Annual Meeting, delegates voted to remove Yeshiva University from the censure list and to add MD Anderson Cancer Center, University of Illinois at Urbana-Champaign, University of Southern Maine, and Felician College (NJ) to the censure list. In addition, delegates passed a resolution denouncing the recent proposals in Wisconsin designed to weaken academic freedom and shared governance, as well as heavily cut funding to the University of Wisconsin system. President Fichtenbaum delivered an inspiring address about the need for a bigger and more inclusive AAUP to fight concerted political attacks on higher education. The meeting was rounded out with notable speakers including Richard F. Griffin, Jr., NLRB General Counsel, and Juan Gonzalez, columnist at New York Daily and cohost of Democracy Now!. Thanks to all Ohio members who participated, as well as to the National AAUP staff and leadership for making AAUP's 101st Annual Meeting a great one. Has Your Campus Been "Koch-ed?" 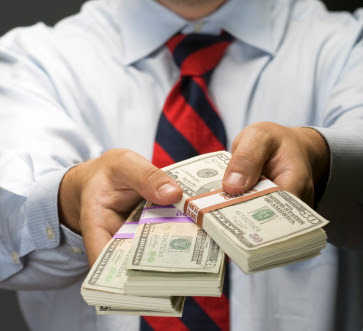 Any organization's or institution's behavior can be influenced significantly by its funding sources. Charles and David Koch, referred to as the Koch Brothers, are known for using their foundations to fund campaigns that undermine workers' right and unions, quality public education, and healthcare expansion. The website www.unkochmycampus.org lists 390 colleges and universities that have received funding from the Koch Brothers. Ohio institutions that have received money from the Charles Koch Foundation include: Akron, Ashland, Baldwin-Wallace, Bowling Green, Cedarville, Kenyon, Ohio State, and Ohio University. In addition, http://polluterwatch.org/charles-koch-university-funding-database contains more detailed information about the amounts given to each institution. More details, including a registration form, will be made available later this summer. Visit the Events Calendar for more information.